Corneal transplant surgery is an important procedure available to patients suffering visual loss related to corneal disease. Dr. Samuel Berger is fellowship trained in the medical and surgical treatment of corneal disease. 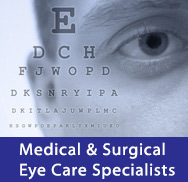 We perform various types of corneal transplant surgery. We perform traditional Penetrating Keratoplasty (PK) which involves removing the full thickness of the cornea and replacing it with a donor cornea which is secured with sutures. This procedure is typically performed on patients with keratoconus or extensive corneal scarring from inherited corneal dystrophies, trauma, or other causes. Dr. Berger is also one of a limited number of local surgeons who has expertise in performing partial thickness corneal transplants which involves replacing only the inner layer of the cornea (DSAEK – Descemet’s Stripping Automated Endothelial Keratoplasty); the donor cornea is held in place without any sutures and allows for more rapid visual recovery. This procedure is typically indicated for patients with Fuchs’ Dystrophy or corneal swelling from another cause.